The launch of the Kia SP Concept based SUV may be some time away, but Kia Motors is on a roll. Its manufacturing plant in Anantapur in Andhra Pradesh is expected to be ready before the intended time lines and the South Korean carmaker has now signed a MoU with the government of Andhra Pradesh to support the state's efforts towards a greener future. 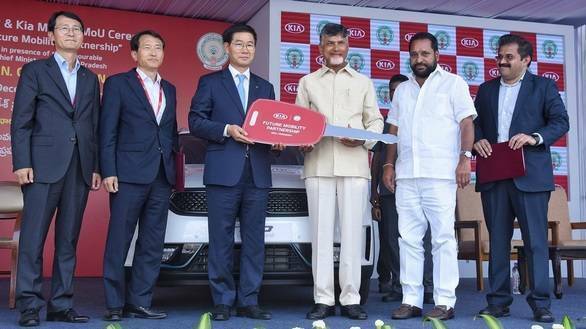 The MoU was signed by Kia India MD, Kookhyun Kim and Andhra Pradesh Chief Minister, N Chandrababu Naidu at the AP Government Secretariat in Amaravati. 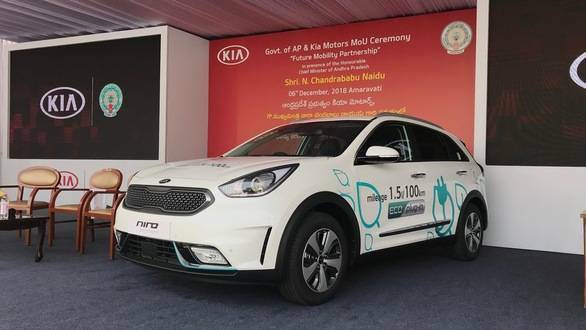 Kia Motors also took the opportunity to donate all three versions of the Kia Niro crossover  the Niro hybrid, the Niro EV and Niro PHEV to the AP Government to support its efforts in making the state greener and cleaner. The cars will be used for VIP movement in the state. The Kia Niro Hybrid is powered by a 1.6-litre, four cylinder Atkinson cycle petrol engine that makes 105PS and 148Nm, along with a 32kW AC Synchronous Permanent Magnet Motor. The motor offers an additional 44PS and 170Nm, drawing power from a 6.5Ah Lithium Ion Polymer battery that's good for 1.56kWh of juice. Combined outputs though stand at 140PS and 264Nm and the power is sent to the wheels via a six-speed dual clutch automatic transmission. The Niro PHEV uses the engine in the exact same guise but its primary source of power is a bigger and more powerful 45kW motor that draws power from an 8.9kWh battery to offer 80PS additionally. The PHEV can also be charged fully via a 3-pin wall socket in just 2 hours, 15 minutes. The Niro EV on the other hand is a full-electric vehicle and boasts an impressive 450km range from its battery pack. Its batteries can be recharged to 80 per cent in just an hour via a fast charging station. 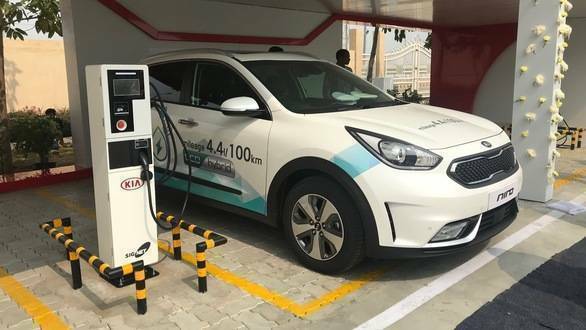 As part of the MoU, Kia Motors has also installed a charging station with two regular chargers at the Secretariat, which will be used to charge the aforementioned cars. There is no confirmation as of now whether or not any of the variants of the Niro will be launched in India, but it is clear that Kia is keenly eyeing the EV/PHEV hybrid segments for the Indian market. The signing of the MoU should further help in strengthening Kia Motor's relationship with the AP Government who has been helping the carmaker in setting up its manufacturing facility in the state. The plant will be Kia's 15th manufacturing plant globally and has seen an investment of 1.1 billion USD. It is expected to be ready in the coming months and once ready, will boast a capacity of churning out 3,00,000 cars annually.